PM China 2016 took place in Shanghai, China. PM China 2016, which took place in Shanghai in April, brought together over 360 exhibitors from all around the world, making it the largest turnout in PM CHINA expo history, its organizers say. 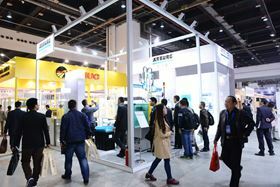 Exhibitors from China, USA, UK, Germany, Italy, Sweden, Switzerland, India, Singapore and Japan showcased their products, machines and solutions during the three-day event. Presentations included a discussion of largee-scale low-cost MIM manufacturing by Fan Xiaojun, Cremer, the influence of mould temperature on the part quality during MIM processing by Arburg’s Dr Hartmut Walcher, MIM and the combined technology-economic situation for high volume production from Prof Randall M German, San Diego State University. Wang Rongkai from Throne presented on the application of pressurized sintering in high quality powder metallurgy industry, while Dr Xuanhui Qu University of S & T Beijing examined powder injection molding of super-alloys and Dr Peng Yu South University of Technology & Science of China considered the metal injection molding of titanium and titanium. This story is reprinted from material from PM China, with editorial changes made by Materials Today. The views expressed in this article do not necessarily represent those of Elsevier.